People’s Medical Publishing House is China’s preeminent publisher of texts in Science and Medicine. Recently they have released a series of texts for Chinese medicine students and doctors, written by experts in the field. 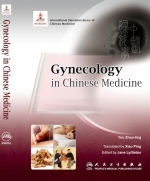 This text is written by Dr You, a renowned gynaecologist, in collaboration with Jane Lyttleton.